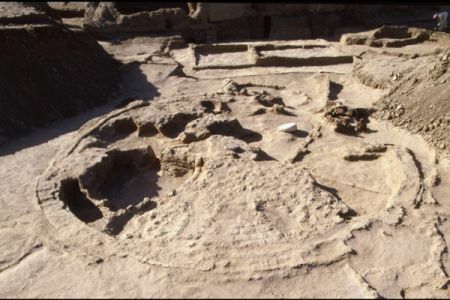 The city supplanted the ancient capital of Kerma, located one kilometre further south. Over the last ten years or so, it has been the object of archaeological excavations concentrating on the religious quarter. The area comprises temples, a 70 m long processional avenue, a palace building as well as enclosure walls with small rectangular bastions. Two large wells, essentially ceremonial in function, are also part of this religious complex. The north well has wide stairs resting on a stone plinth, the masonry of which is characteristic of the Classic Kerma period. The south well’s two entrances are subterranean and vaulted, and located at different levels. 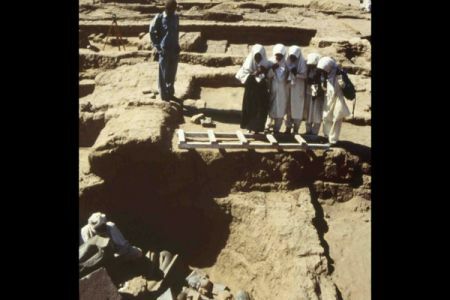 Most likely were they laid out amidst the ruins of a sanctuary abandoned early in the Eighteenth Dynasty. 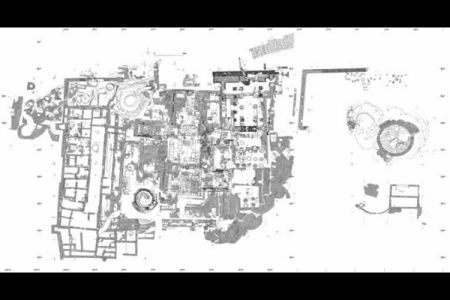 The Napatan and Meroitic temple annexes are located west and south of the religious quarter. These regroup workshops and magazines needed for the production of bread, beer and meat offerings. Bread was baked in terracotta moulds, the remains of which have eventually formed a rather impressive mound that gave the site its name. 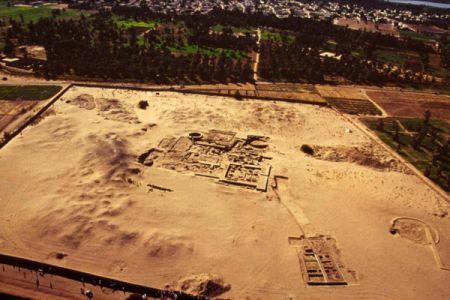 Dukki Gel literally means “red mound.” With the exception of a few burials unearthed in the modern city of the Kerma, the contemporaneous necropolis has yet to be found. 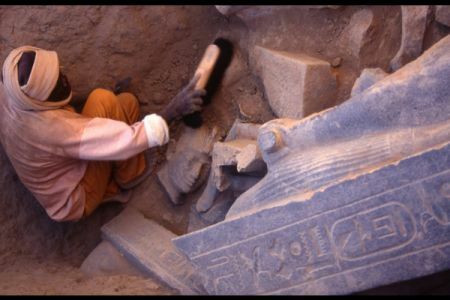 During the clearing of a temple in January 2003, the excavation of a pit containing 40 black granite statue fragments confirms the site’s importance. It was identified as a favissa, where venerated sculptures were deposited for safety, handled with great care. 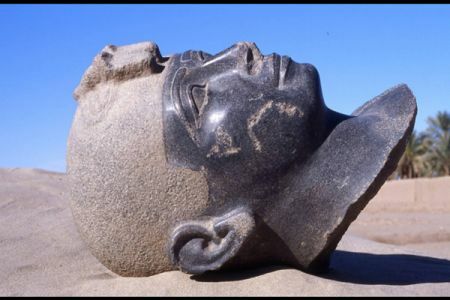 The statues were deliberately broken in order to destroy the “power” of the pharaohs represented: all are broken at the neck and the legs, and occasionally so are the arms, the mekes cases, the nose or the uraei. There are seven monumental statues; they represent the two last kings of the Twenty-fifth Dynasty, Taharqo and Tanwetamani, and three of their successors: Senkamanisken, Anlamani and Aspelta, identified by inscriptions on the back pillar. 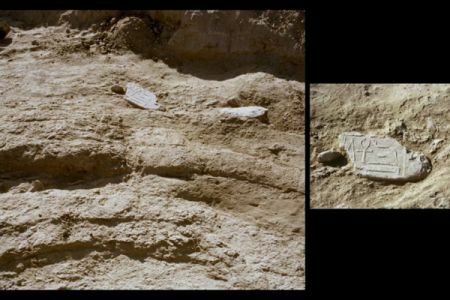 With this discovery, we have confirmation that the site of Dukki Gel truly corresponds to the ancient city of Pnubs because each statue mentions “Amun of Pnubs”, one of the major manifestations of the Kushite Amun. Tanwetamani and Senkamanisken are both represented twice. The tallest statue is that of Taharqo (270 cm) and the smallest, Aspelta (123 cm). 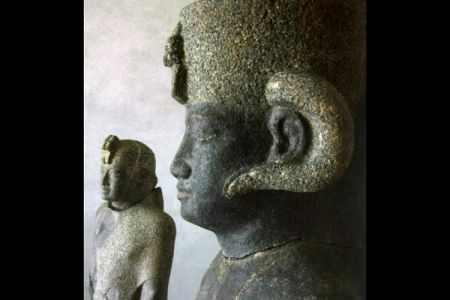 The granite is carefully polished, but some details of the clothing, the adornment or the skullcap are roughened. With this treatment, pigments and fabric covered with a thin layer of gilded gesso could better adhere to the stone. These statues of the “black pharaohs” help increase our knowledge of a period, of which there was little known evidence at Dukki Gel. 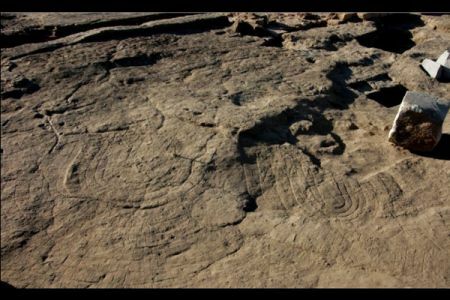 The importance of the site increases considerably as comparisons can be made today with the cachette discovered by George A. Reisner in 1916, at the foot of Gebel Barkal. 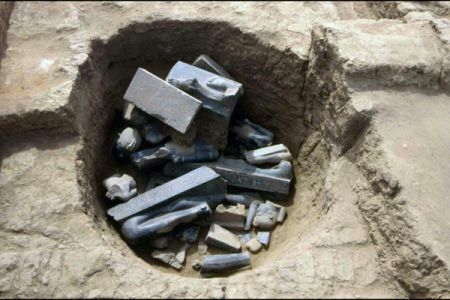 Several years were needed to study and restore the statues, which were likely broken during Psamtik II’s destructive raid on Nubia a little before 590 B.C. For further information, read the publications of C. Bonnet (archaeology), D. Valbelle (epigraphy) and P. Ruffieux (ceramology).